Cadillac hopes cars such as the CT-V Coupe will boost European sales. DETROIT -- General Motors Co. will create a European arm for its Cadillac luxury brand after distributor Kroymans Corp. declared bankruptcy last year. Cadillac Europe will import, market and distribute Cadillacs through a sales and service network in “key European markets,” GM said on Monday in a statement. The company said it would give details later. Kroymans, a Dutch dealership group, went bankrupt in March. But some Cadillacs, such as the CTS and the CTS-V sedans, have remained on sale in Europe since then, Cadillac spokesman Nick Twork said in an e-mail. "Europe is an important market for Cadillac," Bryan Nesbitt, Cadillac general manager said in a statement. "Re-establishing distribution of our premium offerings is good news for those who seek import exclusiveness." Cadillac has never gained a foothold in the European premium market dominated by German luxury carmakers BMW, Mercedes-Benz and Audi. Many Europeans are put off by the brand's brash styling and Cadillac also was late in introducing diesel models in Europe where about half of new cars sold are diesels. 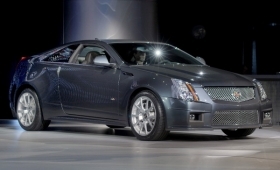 At the Geneva auto show on March 2, Cadillac will give its CTS coupe a European debut. The car will go on sale in Europe this fall after its summer launch in the U.S. The CTS Sport Sedan and range-topping CTS-V, both on sale now, will also be on display in Geneva, along with the CTS Sport Wagon, which will go on sale later this year. A redesigned SRX crossover also will be shown. SRX sales start this summer.